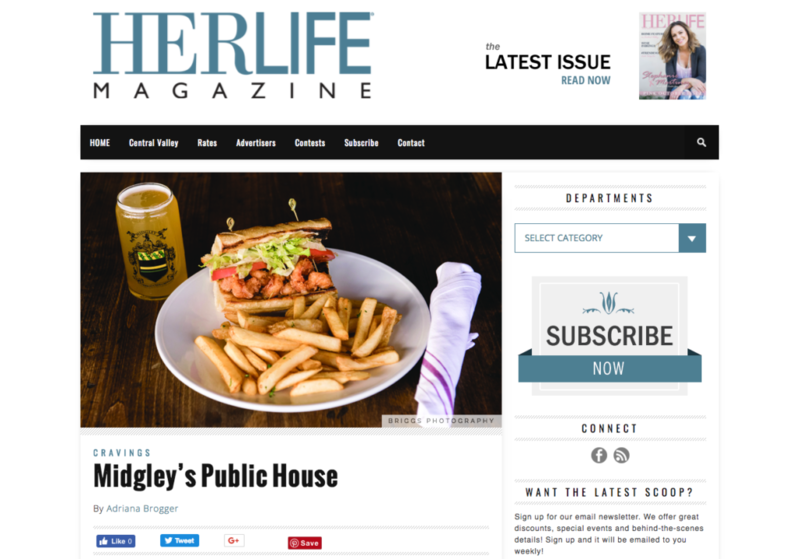 Stockton’s celebrity chef Michael Midgley and his wife, Laci, just celebrated one successful year at their gastropub/steakhouse, Midgley’s Public House. And they are looking forward to many more! Located in Stockton’s Lincoln Center, MPH is the realization of a life-long dream for Chef Midgley. You might recognize him from one of his many national television appearances. He was a memorable contestant on season 2 of Bravo network’s Top Chef and he then won big on Food Network’s Cutthroat Kitchen. If you watched, you certainly noticed his big personality and passion for food. He brings all that and more to his Stockton restaurant. He brings his palate, his style and his whole heart. “We’re family-owned and operated; my sister-in-law is our bartender, my best friend from high school is our bar manager, and my wife does the books and waits tables. And my kids are growing up in here,” Chef Midgley explained about his commitment to make MPH a long-term mainstay in Stockton. There are no lights and cameras on him as he creates his masterpiece dishes at MPH, but the stakes are still high, Chef Midgley admitted. “This is how I feed my family,” he emphasized. That’s the best part about choosing to patronize local businesses, for me anyway. I love knowing that my support of a local business affects people who live in our community.Chef Midgley had lots of offers after his time on television. “After Top Chef I had opportunities to work with other chefs in New York, San Francisco or Vegas. But coming back to Stockton made sense for me. My parents and family have started businesses here. I grew up in this community. I’m a proud Stocktonian,” he explained. HERLIFE staffers were happy to put that confidence to the test for our tasting and photography session! We started off with a BLT Wedge Salad. I love a good salad. And in a kale-heavy trendy-salad world, this classic take on the perfect steakhouse wedge salad is a dream come true. This simple but divine salad features iceberg lettuce, cherry tomatoes, bacon, hard-boiled egg, grapes, parmesan and ranch dressing. The fresh ingredients make this salad a great choice anytime of day. I love the addition of the grapes and the beautiful presentation. The Shrimp Po’ Boy is heaven! Mmmm! Ladies, the fried shrimp in this po’ boy is so delicious. You will love this flavorful sandwich. You can find it on the lunch menu. It comes with your choice of fries or soup of the day. Shrimp is, of course, the star, but you’ll love everything else, too. From the Louisiana-style remoulade to the soft French roll, it is all good! The 8-oz. Filet is beautiful and delicious. The gorgeous certified Angus beef is a wonderful dinner option. It’s beautifully presented alongside mashed potatoes, sautéed spinach and mushrooms. Grilled Salmon and Prawns is another fabulous dinner option we sampled. The salmon is covered in a sweet chili glaze, sautéed prawns, cilantro-green onion rice, asparagus and butter sauce. It was perfectly cooked and the flavors were out of this world. Last but not least, we finished off our perfect lunch date with a dreamy Big Ol’ Chocolate. Six layers of dark chocolate cake. Seriously. I’m still smiling!MPH is a wonderful addition to Stockton’s eats but some locals might have experienced a bit of sticker shock when it came to the dinner menu prices. Chef Midgley is quick to point out that a steak here is not a steak there. There’s an elevated quality at MPH, from the quality of the ingredients, to the preparation, to the service you receive from the knowledgeable and friendly staff. There’s still something for everyone at MPH. “We are affordable despite the reputation we have,” Chef Midgley announced. And they are; there’s Happy Hour 7 days a week from 3:00 p.m. to 6:00 p.m. in the bar and it includes half-off all appetizers, all draft beers, and half price on all house wines. “You could come here for happy hour every day and never get bored. You could come get a half pound of mussels and a glass of wine for $11.00,” Chef Mike explained. Sounds like a great deal to me! MPH offers catering for events of all sizes. They are happy to help you plan small dinners, large weddings, or whatever the occasion. Midgley’s Public House can customize a menu for any sized budget. They even roast whole hogs! Party, anyone? Call to make reservations at 209-474-7700. Midgley’s Public House is located at 296 Lincoln Center, Stockton, California; visit them on the web at midgleyspublichouse.com.